This is the head turning new flagship model for the BMW 7 Series and it’s going to impress with a twin turbo V12 6.6litre engine under the bonnet producing 592bhp. It’s actually called the BMW M760Li xDrive and the twin turbo engine will help the big can reach 0 to 62 mph in a stunning 3.9 seconds. The top speed is 205 mph though it’s limited to 155 mph. The BMW M760Li xDrive will make his debut at the Geneva motor show alongside the more frugal hybrid plug-in, the 740e. Handling is improved by the fact there’s the xDrive all-wheel drive system on board and it has rear wheel drive too. 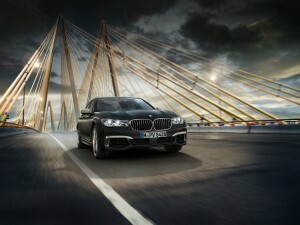 There’s also a specially to suspension and BMW’s Dynamic Drive will help reduce body roll. 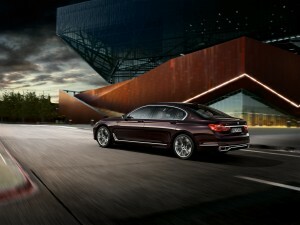 Despite its imposing size and weight, BMW insists that its new M760Li will have a sports car like driving experience. It should sound like a sports car thanks to the new quad-exit exhaust system. Visual additions include new bumpers, 20inch lightweight alloy wheels and larger air intakes. Drivers can also opt for a spoiler on the rear as well. The new BMW 7 Series’ cabin will have various cues that the driver and passengers are sat in the range topper with V12 logos and a branded steering wheel complete with gearshift paddles. There’s also larger dials and new pedals with standard kit including electric seats in the rear and front, leather trim, keyless entry and LED headlights. In addition to the firm’s latest infotainment system, the BMW M760Li xDrive comes with sun blinds in the rear. There’s no indication of prices, but BMW watchers believe the new car will start at around £115,000 when the car hits the showrooms later this year. Once on the road, however, economy is not going to impress with the V12 returning around 22 mpg and having emissions of 294g/km. Those interested in the new plug-in hybrid 740e will find a car based on the X5 which has a 2 litre petrol engine producing 254 bhp and the bonnet along with an electric motor which means the car can return, theoretically, 135 mpg while having emissions of 49g/km. This entry was posted in Car Leasing, Cars, Executive Cars, Performance Car and tagged BMW 7 Series by Steve Lumley. Bookmark the permalink.